"Mass transit" and "mass transport" redirect here. For other uses, see Mass transit (disambiguation). Public transport (also known as public transportation, public transit, or mass transit) is transport of passengers by group travel systems available for use by the general public, typically managed on a schedule, operated on established routes, and that charge a posted fee for each trip. 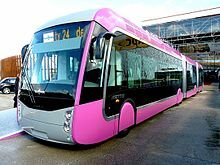 Examples of public transport include city buses, trolleybuses, trams (or light rail) and passenger trains, rapid transit (metro/subway/underground, etc.) and ferries. Public transport between cities is dominated by airlines, coaches, and intercity rail. High-speed rail networks are being developed in many parts of the world. Most public transport systems run along fixed routes with set embarkation/disembarkation points to a prearranged timetable, with the most frequent services running to a headway (e.g. : "every 15 minutes" as opposed to being scheduled for any specific time of the day). However, most public transport trips include other modes of travel, such as passengers walking or catching bus services to access train stations. Share taxis offer on-demand services in many parts of the world, which may compete with fixed public transport lines, or compliment them, by bringing passengers to interchanges. Paratransit is sometimes used in areas of low demand and for people who need a door-to-door service. Urban public transit differs distinctly among Asia, North America, and Europe. In Asia, profit-driven, privately-owned and publicly traded mass transit and real estate conglomerates predominantly operate public transit systems  In North America, municipal transit authorities most commonly run mass transit operations. In Europe, both state-owned and private companies predominantly operate mass transit systems, Public transport services can be profit-driven by use of pay-by-the-distance fares or funded by government subsidies in which flat rate fares are charged to each passenger. Services can be fully profitable through high usership numbers and high farebox recovery ratios, or can be regulated and possibly subsidised from local or national tax revenue. Fully subsidised, free of charge services operate in some towns and cities. For geographical, historical and economic reasons, differences exist internationally regarding use and extent of public transport. While countries in the Old World tend to have extensive and frequent systems serving their old and dense cities, many cities of the New World have more sprawl and much less comprehensive public transport. The International Association of Public Transport (UITP) is the international network for public transport authorities and operators, policy decision-makers, scientific institutes and the public transport supply and service industry. It has 3,400 members from 92 countries from all over the globe. Conveyances designed for public hire are as old as the first ferries, and the earliest public transport was water transport: on land people walked (sometimes in groups and on pilgrimages, as noted in sources such as the Bible and The Canterbury Tales) or (at least in Eurasia and Africa) rode an animal. Ferries appear in Greek mythology—corpses in ancient Greece were buried with a coin underneath their tongue to pay the ferryman Charon to take them to Hades. Some historical forms of public transport include the stagecoach, traveling a fixed route between coaching inns, and the horse-drawn boat carrying paying passengers, which was a feature of European canals from their 17th-century origins. The canal itself as a form of infrastructure dates back to antiquity – ancient Egyptians certainly used a canal for freight transportation to bypass the Aswan cataract – and the Chinese also built canals for water transportation as far back as the Warring States period which began in the 5th century BCE. Whether or not those canals were used for for-hire public transport remains unknown; the Grand Canal in China (begun in 486 BCE) served primarily for shipping grain. The omnibus, the first organized public transit system within a city, appears to have originated in Paris, France, in 1662, although the service in question failed a few months after its founder, Blaise Pascal, died in August 1662; omnibuses are next known to have appeared in Nantes, France, in 1826. The omnibus was introduced to London in July 1829. The first passenger horse-drawn railway opened in 1806: it ran between Swansea and Mumbles in southwest Wales in the United Kingdom. In 1825 George Stephenson built the Locomotion for the Stockton and Darlington Railway in northeast England, the first public steam railway in the world. The first successful electric streetcar was built for 12 miles of track for the Union Passenger Railway in Richmond, Virginia in 1888. Electric streetcars could carry heavier passenger loads than predecessors, which reduced fares and stimulated greater transit use. Two years after the Richmond success, over thirty two thousand electric streetcars were operating in America. Electric streetcars also paved the way for the first subway system in America. Before electric streetcars, steam powered subways were considered. However, most people believed that riders would avoid the smoke filled subway tunnels from the steam engines. In 1894, Boston built the first subway in the United States, an electric streetcar line in a 1.5 mile tunnel under Tremont Street’s retail district. Other cities such as New York quickly followed, constructing hundreds of miles of subway in the following decades. Seven criteria measure the usability of different types of public transport and its overall appeal. The criteria are speed, comfort, safety, cost, proximity, timeliness and directness. Speed is calculated from total journey time including transfers. Proximity means how far passengers must walk or otherwise travel before they can begin the public transport leg of their journey and how close it leaves them to their desired destination. Timeliness is how long they must wait for the vehicle. Directness records how far a journey using public transport deviates from the route. In selecting between competing modes of transport, many individuals are strongly motivated by direct cost (travel fare/ ticket price to them) and convenience, as well as being informed by habit. The same individual may accept the lost time and statistically higher risk of accident in private transport, together with the initial, running and parking costs. Loss of control, spatial constriction, overcrowding, high speeds/accelerations, height and other phobias may discourage use of public transport. Actual travel time on public transport becomes a lesser consideration when predictable and when travel itself is reasonably comfortable (seats, toilets, services), and can thus be scheduled and used pleasurably, productively or for (overnight) rest. Chauffeured movement is enjoyed by many people when it is relaxing, safe but not too monotonous. Waiting, interchanging, stops and holdups, for example due to traffic or for security, are discomforting. Jet lag is a human constraint discouraging frequent rapid long-distance East-West commuting, favoring modern telecommunications and VR technologies. An airline provides scheduled service with aircraft between airports. Air travel has high speeds, but incurs large waiting times prior to and after travel, and is therefore often only feasible over longer distances or in areas where a lack of ground infrastructure makes other modes of transport impossible. Bush airlines work more similarly to bus stops; an aircraft waits for passengers and takes off when the aircraft is full. Bus services use buses on conventional roads to carry numerous passengers on shorter journeys. Buses operate with low capacity (compared with trams or trains), and can operate on conventional roads, with relatively inexpensive bus stops to serve passengers. Therefore, buses are commonly used in smaller cities, towns, and rural areas, and for shuttle services supplementing other means of transit in large cities. Bus rapid transit is an ambiguous term used for buses operating on dedicated right-of-way, much like a light rail. Trolleybuses are electric buses that receive power from overhead wires for mobility. Online Electric Vehicles are buses that run on a conventional battery, but are recharged frequently at certain points via underground wires. Coach services use coaches (long-distance buses) for suburb-to-CBD or longer-distance transportation. The vehicles are normally equipped with more comfortable seating, a separate luggage compartment, video and possibly also a toilet. They have higher standards than city buses, but a limited stopping pattern. Left: Tokyo's Yamanote Line, one of the world's busiest commuter rail lines. Right: Chicago Transit Authority control tower 18 guides elevated Chicago 'L' northbound Purple and Brown lines intersecting with westbound Pink and Green lines and the looping Orange line above the Wells and Lake street intersection in the loop. Passenger rail transport is the conveyance of passengers by means of wheeled vehicles specially designed to run on railways. Trains allow high capacity on short or long distance, but require track, signalling, infrastructure and stations to be built and maintained. Urban rail transit consists of trams, light rail, rapid transit, people movers, commuter rail, monorail, suspension railways and funiculars. Commuter rail is part of an urban area's public transport; it provides faster services to outer suburbs and neighboring towns and villages. Trains stop at stations that are located to serve a smaller suburban or town center. The stations are often combined with shuttle bus or park and ride systems. Frequency may be up to several times per hour, and commuter rail systems may either be part of the national railway or operated by local transit agencies. Intercity rail is long-haul passenger services that connect multiple urban areas. They have few stops, and aim at high average speeds, typically only making one of a few stops per city. These services may also be international. High-speed rail is passenger trains operating significantly faster than conventional rail—typically defined as at least 200 kilometres per hour (120 mph). The most predominant systems have been built in Europe and East Asia, and compared with air travel, offer long-distance rail journeys as quick as air services, have lower prices to compete more effectively and use electricity instead of combustion. 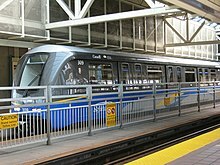 The SkyTrain in Vancouver is the longest rapid transit system in Canada. Systems are able to transport large numbers of people quickly over short distances with little land use. Variations of rapid transit include people movers, small-scale light metro and the commuter rail hybrid S-Bahn. More than 160 cities have rapid transit systems, totalling more than 8,000 km (4,971 mi) of track and 7,000 stations. Twenty-five cities have systems under construction. Light rail is a modern development (and use) of the tram, with dedicated right-of-way not shared with other traffic, (often) step-free access and increased speed. Light rail lines are, thus, essentially modernized interurbans. Personal rapid transit is an automated cab service that runs on rails or a guideway. This is an uncommon mode of transportation (excluding elevators) due to the complexity of automation. A fully implemented system might provide most of the convenience of individual automobiles with the efficiency of public transit. The crucial innovation is that the automated vehicles carry just a few passengers, turn off the guideway to pick up passengers (permitting other PRT vehicles to continue at full speed), and drop them off to the location of their choice (rather than at a stop). Conventional transit simulations show that PRT might attract many auto users in problematic medium-density urban areas. A number of experimental systems are in progress. One might compare personal rapid transit to the more labor-intensive taxi or paratransit modes of transportation, or to the (by now automated) elevators common in many publicly accessible areas. Cable-propelled transit (CPT) is a transit technology that moves people in motor-less, engine-less vehicles that are propelled by a steel cable. 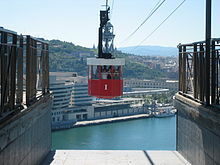 There are two sub-groups of CPT – gondola lifts and cable cars (railway). Gondola lifts are supported and propelled from above by cables, whereas cable cars are supported and propelled from below by cables. While historically associated with usage in ski resorts, gondola lifts are now finding increased consumption and utilization in many urban areas – built specifically for the purposes of mass transit. Many, if not all, of these systems are implemented and fully integrated within existing public transportation networks. Examples include Metrocable (Medellín), Metrocable (Caracas), Portland Aerial Tram, Roosevelt Island Tramway in New York City, and London's Emirates Air Line. A ferry is a boat used to carry (or ferry) passengers, and sometimes their vehicles, across a body of water. A foot-passenger ferry with many stops is sometimes called a water bus. Ferries form a part of the public transport systems of many waterside cities and islands, allowing direct transit between points at a capital cost much lower than bridges or tunnels, though at a lower speed. Ship connections of much larger distances (such as over long distances in water bodies like the Mediterranean Sea) may also be called ferry services. A report published by the UK National Infrastructure Commission in 2018 states that 'cycling is mass transit and must be treated as such'. Cycling infrastructure is normally provided without charge to users because it is cheaper to operate than mechanised transit systems that use sophisticated equipment and do not use human power..
All public transport runs on infrastructure, either on roads, rail, airways or seaways. The infrastructure can be shared with other modes, freight and private transport, or it can be dedicated to public transport. The latter is especially valuable in cases where there are capacity problems for private transport. Investments in infrastructure are expensive and make up a substantial part of the total costs in systems that are new or expanding. Once built, the infrastructure will require operating and maintenance costs, adding to the total cost of public transport. Sometimes governments subsidize infrastructure by providing it free of charge, just as is common with roads for automobiles. Interchanges are locations where passengers can switch from one public transport route to another. This may be between vehicles of the same mode (like a bus interchange), or e.g. between bus and train. It can be between local and intercity transport (such as at a central station or airport). Timetables (or 'schedules' in North American English) are provided by the transport operator to allow users to plan their journeys. They are often supplemented by maps and fare schemes to help travelers coordinate their travel. Online public transport route planners help make planning easier. Mobile apps are available for multiple transit systems that provide timetables and other service information and, in some cases, allow ticket purchase, some allowing to plan your journey, with time fares zones eg. Services are often arranged to operate at regular intervals throughout the day or part of the day (known as clock-face scheduling). Often, more frequent services or even extra routes are operated during the morning and evening rush hours. Coordination between services at interchange points is important to reduce the total travel time for passengers. This can be done by coordinating shuttle services with main routes, or by creating a fixed time (for instance twice per hour) when all bus and rail routes meet at a station and exchange passengers. There is often a potential conflict between this objective and optimising the utilisation of vehicles and drivers. The main sources of financing are ticket revenue, government subsidies and advertising. The percentage of revenue from passenger charges is known as the farebox recovery ratio. A limited amount of income may come from land development and rental income from stores and vendors, parking fees, and leasing tunnels and rights-of-way to carry fiber optic communication lines. Most—but not all—public transport requires the purchase of a ticket to generate revenue for the operators. Tickets may be bought either in advance, or at the time of the journey, or the carrier may allow both methods. Passengers may be issued with a paper ticket, a metal or plastic token, or a magnetic or electronic card (smart card, contactless smart card). Sometimes a ticket has to be validated, e.g. a paper ticket has to be stamped, or an electronic ticket has to be checked in. Tickets may be valid for a single (or return) trip, or valid within a certain area for a period of time (see transit pass). The fare is based on the travel class, either depending on the traveled distance, or based on zone pricing. The tickets may have to be shown or checked automatically at the station platform or when boarding, or during the ride by a conductor. Operators may choose to control all riders, allowing sale of the ticket at the time of ride. Alternatively, a proof-of-payment system allows riders to enter the vehicles without showing the ticket, but riders may or may not be controlled by a ticket controller; if the rider fails to show proof of payment, the operator may fine the rider at the magnitude of the fare. Multi-use tickets allow travel more than once. In addition to return tickets, this includes period cards allowing travel within a certain area (for instance month cards), or during a given number of days that can be chosen within a longer period of time (for instance eight days within a month). Passes aimed at tourists, allowing free or discounted entry at many tourist attractions, typically include zero-fare public transport within the city. Period tickets may be for a particular route (in both directions), or for a whole network. A free travel pass allowing free and unlimited travel within a system is sometimes granted to particular social sectors, for example students, elderly, children, employees (job ticket) and the physically or mentally disabled. Zero-fare public transport services are funded in full by means other than collecting a fare from passengers, normally through heavy subsidy or commercial sponsorship by businesses. Several mid-size European cities and many smaller towns around the world have converted their entire bus networks to zero-fare. The only European capital with free public transport is Tallinn. Local zero-fare shuttles or inner-city loops are far more common than city-wide systems. There are also zero-fare airport circulators and university transportation systems. Governments frequently opt to subsidize public transport for social, environmental or economic reasons. Common motivations include the desire to provide transport to people who are unable to use an automobile and to reduce congestion, land use and automobile emissions. Subsidies may take the form of direct payments for financially unprofitable services, but support may also include indirect subsidies. For example, the government may allow free or reduced-cost use of state-owned infrastructure such as railways and roads, to stimulate public transport's economic competitiveness over private transport, that normally also has free infrastructure (subsidized through such things as gas taxes). Other subsidies include tax advantages (for instance aviation fuel is typically not taxed), bailouts if companies that are likely to collapse (often applied to airlines) and reduction of competition through licensing schemes (often applied to taxis and airlines). Private transport is normally subsidized indirectly through free roads and infrastructure, as well as incentives to build car factories and, on occasion, directly via bailouts of automakers. Land development schemes may be initialized, where operators are given the rights to use lands near stations, depots, or tracks for property development. For instance, in Hong Kong, MTR Corporation Limited and KCR Corporation generate additional profits from land development to partially cover the cost of the construction of the urban rail system. In the United States expansion of public transportation systems is often opposed by critics who see them as vehicles for violent criminals and homeless persons to expand into new areas (to which they would otherwise have to walk). According to the Transportation Research Board, "[v]iolent crime is perceived as pandemic .... Personal security affects many peoples' [sic] decisions to use public transportation." Despite the occasional highly publicized incident, the vast majority of modern public transport systems are well designed and patrolled and generally have low crime rates. Many systems are monitored by CCTV, mirrors, or patrol. Nevertheless, some systems attract vagrants who use the stations or trains as sleeping shelters, though most operators have practices that discourage this. Though public transit accidents attract far more publicity than car wrecks, public transport has much lower accident rates. Annually, public transit prevents 200,000 deaths, injuries, and accidents had equivalent trips been made by car. The National Safety Council estimates that riding the bus is over 170 times safer than private car. Although there is continuing debate as to the true efficiency of different modes of transportation, mass transit is generally regarded as significantly more energy efficient than other forms of travel. A 2002 study by the Brookings Institution and the American Enterprise Institute found that public transportation in the U.S uses approximately half the fuel required by cars, SUV's and light trucks. In addition, the study noted that "private vehicles emit about 95 percent more carbon monoxide, 92 percent more volatile organic compounds and about twice as much carbon dioxide and nitrogen oxide than public vehicles for every passenger mile traveled". A 2004 study from Lancaster University concluded that there was no environmental benefit to be gained from persuading car or plane travelers to switch to trains. Environmental group Friends of the Earth were skeptical of the findings, claiming the results are not in line with previous studies. The study showed that trains had failed to keep up with the advances that the automotive and aviation industries had made in improved fuel efficiency. Express trains travelling from London to Edinburgh consumed 11.5 litres more fuel per seat than a modern diesel car. Studies have shown that there is a strong inverse correlation between urban population density and energy consumption per capita, and that public transport could facilitate increased urban population densities, and thus reduce travel distances and fossil fuel consumption. Supporters of the green movement usually advocate public transportation, because it offers decreased airborne pollution compared to automobiles. A study conducted in Milan, Italy, in 2004 during and after a transportation strike serves to illustrate the impact that mass transportation has on the environment. Air samples were taken between 2 and 9 January, and then tested for methane, carbon monoxide, non-methane hydrocarbons (NMHCs), and other gases identified as harmful to the environment. The figure below is a computer simulation showing the results of the study "with 2 January showing the lowest concentrations as a result of decreased activity in the city during the holiday season. 9 January showed the highest NMHC concentrations because of increased vehicular activity in the city due to a public transportation strike." Based on the benefits of public transport, the green movement has impacted public policy. For example, the state of New Jersey released Getting to Work: Reconnecting Jobs with Transit. This initiative attempts to relocate new jobs into areas with higher public transportation accessibility. The initiative cites the use of public transportation as being a means of reducing traffic congestion, providing an economic boost to the areas of job relocation, and most importantly, contributing to a green environment by reducing carbon dioxide (CO2) emissions. Using public transportation can result in a reduction of an individual's carbon footprint. A single person, 20-mile (32 km) round trip by car can be replaced using public transportation and result in a net CO2 emissions reduction of 4,800 pounds (2,200 kg) per year. Using public transportation saves CO2 emissions in more ways than simply travel as public transportation can help to alleviate traffic congestion as well as promote more efficient land use. When all three of these are considered, it is estimated that 37 million metric tons of CO2 will be saved annually. Another study claims that using public transit instead of private in the U.S. in 2005 would have reduced CO2 emissions by 3.9 million metric tons and that the resulting traffic congestion reduction accounts for an additional 3.0 million metric tons of CO2 saved. This is a total savings of about 6.9 million metric tons per year given the 2005 values. In order to compare energy impact of public transportation to private transportation, the amount of energy per passenger mile must be calculated. The reason that comparing the energy expenditure per person is necessary is to normalize the data for easy comparison. Here, the units are in per 100 p-km (read as person kilometer or passenger kilometer). In terms of energy consumption, public transportation is better than individual transport in a personal vehicle. In England, bus and rail are popular methods of public transportation, especially in London. Rail provides rapid movement into and out of the city of London while busing helps to provide transport within the city itself. As of 2006–2007, the total energy cost of London's trains was 15 kWh per 100 p-km, about 5 times better than a personal car. For busing in London, it was 32 kWh per 100 p-km, or about 2.5 times that of a personal car. This includes lighting, depots, inefficiencies due to capacity (i.e., the train or bus may not be operating at full capacity at all times), and other inefficiencies. Efficiencies of transport in Japan in 1999 were 68 kWh per 100 p-km for a personal car, 19 kWh per 100 p-km for a bus, 6 kWh per 100 p-km for rail, 51 kWh per 100 p-km for air, and 57 kWh per 100 p-km for sea. These numbers from either country can be used in energy comparison calculations or life cycle assessment calculations. Public transportation also provides an arena to test environmentally friendly fuel alternatives, such as hydrogen-powered vehicles. Swapping out materials to create lighter public transportation vehicles with the same or better performance will increase environmental friendliness of public transportation vehicles while maintaining current standards or improving them. Informing the public about the positive environmental effects of using public transportation in addition to pointing out the potential economic benefit is an important first step towards making a difference. An important social role played by public transport is to ensure that all members of society are able to travel, not just those with a driving license and access to an automobile—which include groups such as the young, the old, the poor, those with medical conditions, and people banned from driving. Automobile dependency is a name given by policy makers to places where those without access to a private vehicle do not have access to independent mobility. Above that, public transportation opens to its users the possibility of meeting other people, as no concentration is diverted from interacting with fellow-travelers due to any steering activities. Adding to the above-said, public transport becomes a location of inter-social encounters across all boundaries of social, ethnic and other types of affiliation. In the past, public transport allowed transport at an economy of scale not available through private transport. Nowadays there is considerable debate on the advantages and disadvantages of mass transit. According to the OECD, the advantages of carsharing networks could very well obviate the need for traditional public transport. Advocates of public transport claim that investing in mass transit will ultimately reduce the total transport cost for the public. Time saved can also be significant, as fewer cars can translate to less congestion, and faster speeds for remaining motorists. Transit-oriented development can both improve the usefulness and efficiency of the public transit system as well as result in increased business for commercial developments. Because of the increased traffic and access to transit systems, putting in public transit frequently has a positive effect on real estate prices. For example, the Washington DC Metro system has increased land desirability around its stations, and The Hong Kong metro MTR generates a profit by redeveloping land around and above its stations. Much public opposition to new transit construction can be based on the concern about the impact on neighborhoods of this new economic development. Few localities have the ability to seize and reassign development rights to a private transit operator, as Hong Kong has done. Investment in public transport also has secondary positive effects on the local economy, with between $4 and $9 of economic activity resulting from every dollar spent. 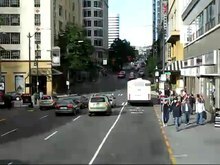 Many businesses rely on access to a transit system, in particular in cities and countries where access to cars is less widespread, businesses which require large numbers of people going to a same place may not be able to accommodate a large number of cars (concert venues, sport stadia, airports, exhibitions centres,...), or businesses where people are not able to use a car (bars, hospitals, or industries in the tourism sector whose customers may not have their cars). Transit systems also have an effect on derived businesses: commercial websites have been founded, such as Hopstop.com, that give directions through mass transit systems; in some cities, such as London, products themed on the local transport system are a popular tourist souvenir. Research in the Washington, DC area shows that public transport does a better job of providing high-skill residents with access to high-skill jobs than it does mid-skill residents to mid-skill jobs and low-skill residents to low-skill jobs. However, public transport projects frequently have very large upfront costs, requiring large investments from either local government or private investors. Initial estimates of project cost and timescale are frequently underestimated, and nearly all public transport requires government subsidies or direct government support in order to remain operational. The existence of a transit system can lower land values in some cases, either through influence on a region's demographics and crime rate (actual or perceived), or simply through the ambient noise and other discomforts the system creates. Longer distance public transport sometimes sell food and drinks on board, or have a dedicated buffet car or dining car. However, some urban transport systems forbid the consumption of food, drink, or even chewing gum when riding on public transport. Sometimes only certain types of food are forbidden with a higher risk of making a mess, e.g. ice creams and chips, and sometimes crisps. Some systems prohibit carrying open food or beverage containers, even if the food or beverage is not being consumed during the journey. In Australia, Canada, India, New Zealand, Norway, Botswana, South Africa, Switzerland, the United States, and most of the European Union, smoking is prohibited in all, or some parts of most public transportation systems due to health and safety issues. Generally smoking is not allowed on buses and trains, while rules concerning stations and waiting platforms differ from system to system. The situation in other countries varies widely, due to varying smoking laws. Many mass transit systems prohibit the use of audio devices, such as mobile phones, radios, and MP3 players unless used with earphones through which only the user can hear the audio transmitted. Some mass transit systems have restricted the use of mobile phones. Long distance train services, such as the Amtrak system in the United States, have "quiet cars" where mobile phone usage is prohibited. Some systems forbid passengers from engaging in conversation with the operator. Others require that passengers who engage in any conversation must keep the noise level low enough that it not be audible to other passengers. Some systems have regulations on the use of profanity. In the United States, this has been challenged as a free speech issue. Certain items considered to be problematic are prohibited or regulated on many mass transit systems. These include firearms and other weapons (unless licensed to carry), explosives, flammable items, or hazardous chemicals and substances. Many systems prohibit live animals, but allow those that are in carrying cases or other closed containers. Additionally, guide dogs for the blind or disabled are usually exempt from these rules. Some systems prohibit items of a large size that may take up a lot of space, such as non-folding bicycles. But more systems in recent years have been permitting passengers to bring bicycles onboard public transport. In Sydney, it is illegal to carry spray cans or permanent markers on board public transport, as they can be used to cause vandalism to the vehicles and stations. This rule also applies to sharp instruments that could damage on the train; such as screwdrivers that could be used to make "scratchitti", a form of vandalism where tags are carved into a window. Many systems have regulations against behavior deemed to be unruly or otherwise disturbing to other passengers. In such cases, it is usually at the discretion of the operator, police officers, or other transit employees to determine what behaviors fit this description. Some systems[which?] have regulations against photography or videography of the system's vehicles, stations, or other property. Those seen holding a mobile phone in a manner consistent with photography are considered to be suspicious for breaking this rule. This is another issue that is challenged in the courts in the United States as a "Free Speech" issue. Almost all riders are equipped with cell phones which can take pictures or record what is happening on the lines. Riders are able to record the actions of transit police and transportation system employees. In the era when long distance trips took several days, sleeping accommodations were an essential part of transportation. (On land, the lodging involved was often part of the infrastructure: the inn or ryokan, which did not move, sheltered travellers. People also slept on ships at sea.) Today, most airlines, inter-city trains and coaches offer reclining seats and many provide pillows and blankets for overnight travellers. Better sleeping arrangements are commonly offered for a premium fare and include sleeping cars on overnight trains, larger private cabins on ships and aircraft seats that convert into beds. Budget-conscious tourists sometimes plan their trips using overnight train or bus journeys instead of paying for a hotel. The ability to get additional sleep on the way to work is attractive to many commuters using public transport. Because night trains or coaches can be cheaper than motels, homeless persons often use these as overnight shelters, as with the famous Line 22 ("Hotel 22") in Silicon Valley. Specifically, a local transit route with a long overnight segment and which accepts inexpensive multi-use passes will acquire a reputation as a "moving hotel" for people with limited funds. Most transportation agencies actively discourage this. 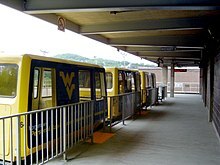 For this and other reasons passengers are often required to exit the vehicle at the end of the line; they can board again in the same or another vehicle, after some waiting. Even a low fare in some cases often deters the poorest individuals, including homeless people. ^ "public transport". English Oxford Living Dictionaries. Oxford University Press. Retrieved 2018-01-30. Buses, trains, and other forms of transport that are available to the public, charge set fares, and run on fixed routes. ^ Joseph L. Schofer. "Mass transit". Encyclopædia Britannica. Encyclopædia Britannica. Retrieved 2018-01-30. Mass transit, also called mass transportation, or public transportation, the movement of people within urban areas using group travel technologies such as buses and trains. ^ a b McLeod, Sam (2017). "Urban Public Transport: Planning Principles and Emerging Practice". Journal of Planning Literature. 32 (3): 223–239. doi:10.1177/0885412217693570. ^ Calimente, John (2012). "Rail integrated communities in Tokyo". Journal of Transport and Land Use. 5. doi:10.5198/jtlu.v5i1.280. ^ "Lessons from Japanese Experiences of Roles of Public and Private Sectors in Urban Transport". Japan Railway & Transport Review. ^ In the Americas and Oceania, beasts of burden were generally not as large, although the Incas did use llamas as pack animals. See Pre Columbian Wheels. ^ Gods, Goddesses, and Mythology. Marshall Cavendish. 1 January 2005. ISBN 9780761475644 – via Google Books. ^ web-page (in French) at http://www.herodote.net/histoire/evenement.php?jour=18260810. Retrieved 13 June 2008. ^ "The London Omnibus". Knowledgeoflondon.com. Retrieved 21 October 2011. ^ "Early Days of Mumbles Railway". BBC. 15 February 2007. Retrieved 19 September 2007. ^ Young, Jay (2015-03-02). "Infrastructure: Mass Transit in 19th- and 20th-Century Urban America". Oxford Research Encyclopedia of American History. doi:10.1093/acrefore/9780199329175.001.0001 (inactive 2019-02-05). Retrieved 28 November 2018. ^ Humphreys, Pat (17 December 2016). "City Transport in the 2020s". Transport and Travel. Retrieved 20 January 2017. ^ "KAIST Online Electric Vehicle". Gizmag.com. Retrieved 21 October 2011. ^ Eli (26 May 2010). "High Speed Train VS Airplane". Tech the Future. Retrieved 21 October 2011. ^ "Rapid transit". Merriam-Webster. Retrieved 27 February 2008. ; "Metro". International Association of Public Transport. Archived from the original on 27 June 2013. Retrieved 27 February 2008. ^ "Glossary of Transit Terminology". American Public Transportation Association. Archived from the original on 27 September 2007. Retrieved 27 February 2008. ^ Andrew Gilligan. "Running out of road". National Infrastructure Commission. National Infrastructure Commission. Retrieved 2018-01-30. cycling is mass transit and must be treated as such. ^ Litman, Todd (June 2014). "Evaluating Transportation Equity: Guidance for Incorporating Distributional Impacts in Transportation Planning" (PDF). ^ Litman, Todd (September 2016). "Evaluating Public Transit Benefits and Costs" (PDF). ^ Subsidies In Oregon Highway Transportation – Publications Index. Pubsindex.trb.org. 31 January 1983. ISBN 9780309033619. Retrieved 21 October 2011. ^ "Canadian auto subsidies: Money for nothing? | vox – Research-based policy analysis and commentary from leading economists". Voxeu.org. 21 December 2008. Retrieved 21 October 2011. ^ "General Motors bailout details". Chicago Sun-Times. Archived from the original on 18 April 2010. ^ Roth, Alisa (4 December 2008). "Auto bailout talk is history repeating | Marketplace From American Public Media". Marketplace.publicradio.org. Archived from the original on 11 July 2012. Retrieved 21 October 2011. ^ Verougstraete, Matheiu; Zeng, Han (July 2014). "Land Value Capture Mechanism: The Case of the Hong Kong Mass Transit Railway" (PDF). www.unescap.org. United Nations Economic and Social Commission for Asia and the Pacific. ^ "GAO-05-423SP Highlights of an Expert Panel: The Benefits and Costs of Highway and Transit Investments" (PDF). Retrieved 21 October 2011. ^ "Transit key in pollution, poverty fights". The Star. Toronto. 12 May 2008. Archived from the original on 22 October 2012. ^ "CDC – Healthy Places – Respiratory Health and Air Pollution". Cdc.gov. Retrieved 21 October 2011. ^ "Microsoft Word – 5_10-Air" (PDF). Retrieved 2012-10-29. ^ "Highway Construction Cost / Inflation Issues – Contract Admin – Construction – FHWA". Fhwa.dot.gov. 22 August 2011. Retrieved 21 October 2011. ^ Victoria Transport Public Institute. "Victoria Transport Institute – Transportation Cost and Benefit Analysis". Vtpi.org. Retrieved 21 October 2011. ^ "Online TDM Encyclopedia – Congestion Reduction". Vtpi.org. Retrieved 21 October 2011. ^ "WSDOT – Moving Washington – A program to fight congestion". Wsdot.wa.gov. Retrieved 21 October 2011. ^ "Transportation Invest In Our Future – Surface Transportation Policy Recommendations". Transportation1.org. Archived from the original on 2013-03-10. Retrieved 21 October 2011. ^ RAND Corporation (16 September 2010). "Reducing Traffic Congestion in Los Angeles". RAND. Retrieved 21 October 2011. ^ "Page Not Found » Search » Washington Policy Center". 13 March 2016. Archived from the original on 2016-03-13. ^ Achs, Nicole. "Roadblocks to public transit: for reasons ranging from prejudice to pragmatism, many suburbanites are fighting tooth and nail to keep mass transit out of their neighborhoods." American City & County 106, no. 1 (January 1991): 28–32. ^ Transit Cooperative Research Program, TCRP Synthesis 21: Improving Transit Security (Washington, D.C.: Transportation Research Board, 1997), 3. ^ "Public Transportation Takes Us There". ^ "Van Hool presents the ExquiCity Design Mettis". Archived from the original on 5 June 2013. Retrieved 5 June 2012. ^ Paul Marston (21 June 2004). "Cars are more fuel-efficient than trains, claims study". The Daily Telegraph. UK: Telegraph Media Group. Retrieved 18 March 2009. ^ Barletta, Barbara; Dabdub, Donald; Blake, Donald R.; Rowand, F. Sherwood; Nissenson, Paul; Meinardi, Simone (2008). "Influence of the public transportation system on the air quality of a major urban center. A case study: Milan, Italy". Atmospheric Environment. 42 (34): 7915–7923. doi:10.1016/j.atmosenv.2008.07.046. ^ a b Public Transportation Reduces Greenhouse Gases and Conserves Energy. ^ "UITP – Public transport alleviates congestion" (PDF). Archived from the original (PDF) on 10 September 2010. Retrieved 21 October 2011. ^ "UITP Advocacy". Uitp.org. Archived from the original on 2012-03-10. Retrieved 21 October 2011. ^ Kulyk, Walter (2002). Urban Public Transportation Systems: Ensuring Sustainability Through Mass Transit. American Society of Civil Engineers. pp. 408–409. ISBN 978-0-7844-0717-2. ^ Litman, T. (1999). "The Costs of Automobile Dependency and the Benefits of Balanced Transport". Victoria Public Policy Institute. ^ OECD. "Urban Mobility System Upgrade" (PDF). International Transport Forum. OECD. Retrieved 21 November 2016. ^ "The Business Case for Investment in Public Transportation" (PDF). APTA. March 2015. Retrieved 3 March 2016. ^ Jane Lii, "Refuge On The Road: Homeless Find Nighttime Haven – The No. 22 Bus From Menlo Park To San Jose", San Jose Mercury News, 9 January 2000, 1A. ^ Cathy Newman, "Silicon Valley: Inside the Dream Incubator", National Geographic 200, no. 6 (December 2001): 52–76. Needle, Jerome A.; Transportation Security Board & Cobb, Renée M. (1997). Improving Transit Security. Transportation Security Board. ISBN 978-0-309-06013-4. Newman, Peter; Jeffrey R. Kenworthy (1999). Sustainability and Cities: Overcoming Automobile Dependence. Island Press. ISBN 978-1-55963-660-5. Ovenden, Mark (2007). Transit Maps of the World. London: Penguin. p. 7. ISBN 978-0-14-311265-5. Valderrama, A.; Beltran, I. (2007). "Diesel versus compressed natural gas in Transmilenio-Bogotá: innovation, precaution, and distribution of risk". Sustainability: Science, Practice, & Policy 3(1):59–67. Archived from the original on 30 June 2007. Retrieved 2 March 2017. Wikimedia Commons has media related to Public transport. Transit Standards - Knowledge base on branding, digital strategy, and graphic standards for public transit, compiled by Stewart Mader. Contains over 100 resources and examples, including 30 graphics standards manuals from transit agencies worldwide. This page was last edited on 9 March 2019, at 12:37 (UTC).